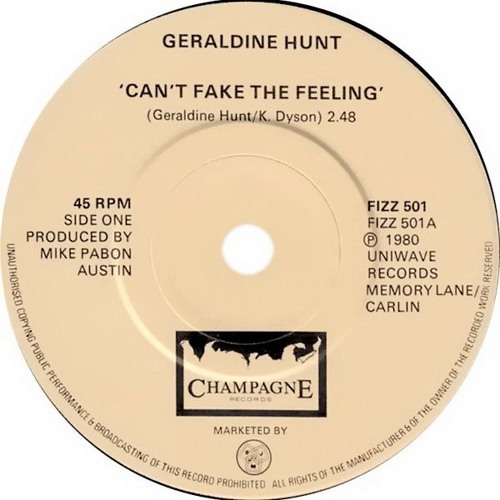 Geraldine Hunt - Can't Fake The Feeling (Dj ''S'' Remix) by Dj "S"
MUITO BOM DJ S VALEU!!!! Your re-edits are just awesome! Where can I buy or download 'em? AWESOME! REPOSTED ON OUR CHANNEL! Absolute DANCE_CLASSIC, THX 4 da RMX! Is this gonna get a release? Man would I love to play this. Great edit. we gonna be able to buy this mate? bloody lovely init! GROOVIN IT FOR SURE ! Really lovin' this, great re-work!!! Is the track likley to see a release? if so do you have any dates, would love to buy a copy. FOR ME ONE BIG SOUND OF DECADE AND NOW ONE BIG SOUND.CONGRATULATIONS. LUCCA DJ.